How Can I Be More Confident In An Interview? I was recently sitting in at an interview. Two interviewees caught my attention; one was rightly qualified for the position, and she fit what the client was looking for. However, she was shy and could barely communicate her ideas and past experience. The second candidate was not as qualified as the first, he, however, was confident, had charisma, and articulated his points very well. While the qualified applicant got the job, similar situations don’t always have a happy ending. In many instances, the less qualified candidate with right presentation skills and confidence usually gets the job. You have applied for the job, you have been successfully shortlisted, and called in for an interview. While this stage should be received with joy –as you’re one step closer to getting the job, it is a stage many people fear. To many job seekers, interviews are a time when they are made to feel intimidated and thrust out of their comfort zone. Here are six practical ways to help you prepare for an interview. 1. A firm handshake – While greeting the recruiter or employer, ensure you offer a firm handshake. A firm handshake adds to your professional appeal. 2. Your Dressing – Different jobs require different dress codes. It’s important to dress right for the interview. If you’re unsure, try and imagine you’ve already secured the job and you’re dressing for your first day. 3. Audibility – How should you speak when in an interview? Try not to be too loud or inaudible as it could inconvenience the interviewer or cause them to struggle to hear you. Ensure you pronounce all your words accurately and in a reasonably audible manner. 4. Posture – How you sit in an interview room is important. If you lean too forward, you might make the interviewer feel as though you’re invading their personal space. If you sit back, you might seem too unprofessional and disrespectful. When in an interview, sit upright without slouching. 5. Your hands – Where do you place your hands during an interview? Do you tend to fidget or put them in your pockets? With the help of an interview coach, you’ll be able to understand how to use your hands in an interview room. 6. Your eyes – Should you look at the interviewer? Won’t they think you’re trying to intimidate them! Should you look away? Won’t they think you’re being evasive? According to Lucy, one of our top interview coaches, you should maintain a soft look that does not intimidate the interviewer but still shows you’re attentive to the interview. When it comes to an interview, every detail counts. You need to position yourself as a serious and professional candidate. While this can be a tough time for many job seekers, it does not have to be. At Corporate Staffing Services, we have professional interview coaches who will sit with you in a one-on-one setting and help you navigate every step of the interviewing process, the questions expected and their most potent answers. 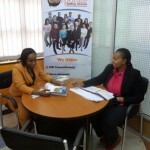 Email us today at clientservice@corporatestaffing.co.ke to book an interview coaching session. For inquiries, call us at 0722 735 216 today and perfect your interviewing skills and increase your chances of getting that job.